Since we first featured the story of Nana on the 24th of May we have received a huge outpouring of support for this very brave little boy. After sending his story out on social media, local media and the Kieno Cummings Show on Cape Talk we have had donations of a video player, dvd’s, clothing, food, treats, games, toiletries, a cd player, a silver angle, electricity vouchers, shopping vouchers and the cash donations amounting to an incredible R 18,390.00 – Thank you Cape Town ! Our accountants have opened a separate ledger for Nana and any monies spent will be itemised and approved by our board. A copy is available on request from our office. Please email carol@iris-house.org with your request. 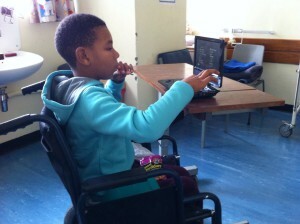 We thought you would like an update on Nana’s progress in hospital and his sisters home circumstances. Nana is still in Karl Bremer hospital. We have set up a 7 day rooster to ensure he gets a daily visit from one of our volunteers or care team members. His level of education has also been assessed and we have put together a bedside education package for him to help him catch up on all the schooling his missed. We are not surprised that he is loving his lessons and is a very quick learner. He has undergone a second debridement procedure for his wounds, which have now healed enough to start with skin graphs which have been taken from his thigh. He had the first skin graph done on Friday the 12th of June and is recovering well. 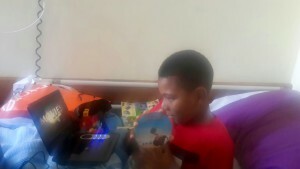 He is also loving his DVD player and his new CD player will be taken into the ward tomorrow. He has a special air mattress and is now able to sit for short periods of time. Every visit with Nana is special, he is always so happy to see us and so grateful and appreciative for all his gifts. He treats ever pencil, soft toy, game or treat as if it were gold and is still amazed that the people of Cape Town care so much about him. We are also providing play therapy for him to assist him to deal with the pain of losing his Mom and overcome the trauma he experienced when he was shot. 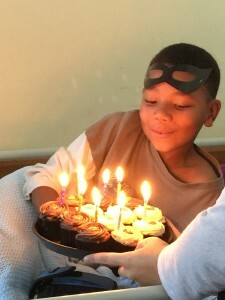 Nana recently celebrated his 9th birthday surrounded by the Iris House team. With the help of the Department of Social Development we have secured a placement for Nana at the Western Cape Rehabilitation Centre. Once he is well enough he will go straight there from Karl Bremer. We are hoping his rehabilitation will begin in July. Nana’s sisters, Amy 18 and Thandi 16 are doing well. 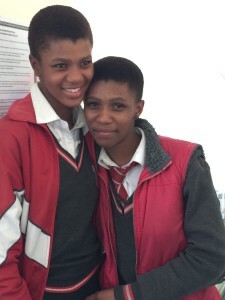 They are both busy writing exams at the moment and we have been in contact with their school to check on their progress. The school reports they are both much happier and able to concentrate more in class. We will also be providing them with grief counselling after their exams . To date we have provided food, electricity vouchers, warm clothes, toiletries and transport money for them to visit Nana and to go to school. In June they did not receive any of Nana’s grant money as this seems to have been withdrawn by his Father and not passed on. We are investigating this with SASA with a view to stoping the grant card until it can be safely paid to the eldest sister Amy. 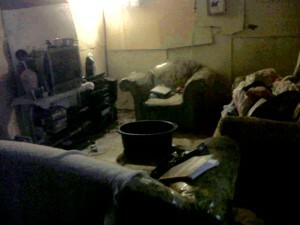 We are also having a plug fixed at their home as it is unsafe. 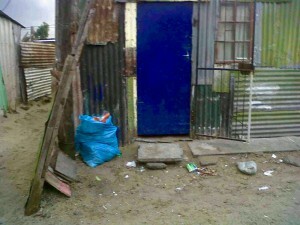 Our social worker together with the Department of Social Development are looking into their living arrangements. Our care team manager Zintle checks in on the girls regularly. 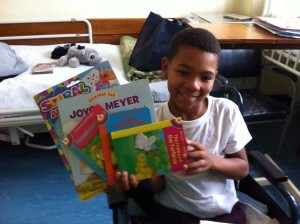 Thandi will be joining us at the Hospice during the school holidays to help with sorting clothing donations. We will also be purchasing the girls a new cell phone so they can keep in touch with us, the one they have at the moment has a cracked screen so they cant read our messages very well. Today (Saturday 13th June) Barbara from Ground up went with Zintle to interview the girls at their home. We were so touched when they told Barbara that Iris House had “lifted their burden and shared their pain” We will publish the article on our Website and Facebook page a soon as it is available. From all of us at Iris House we would like to Thank all of the fantastic people who have contributed to Nana’s appeal so far. We ask that you continue to follow his story and stay with us on what will undoubtably be a long journey. We so appreciate all the emails, messages and phone calls of support we receive daily it means so much to our team. Nana and his sister’s are only children, it is unthinkable that they have already suffered such hardship and violence in their young lives and yet they remain so positive, humble and trusting. If these children are a representation of our future leaders, then we are in good hands. THANK YOU Nana Supporters. Please share Nana’s story with your friends and continue to assist where you can, so we can continue supporting this very special boy and his sisters. !